EVGA GeForce 6200 AGP 8X Graphics Card. Accelerated Graphics Port, often abbreviated as AGP, is a standard type of connection for internal video cards. Generally, Accelerated Graphics Port refers to the actual expansion slot on the motherboard that accepts AGP video cards as well as to the types of video cards themselves. The transfer rate is basically the bandwidth, and is measured in megabytes. The 1X, 2X, 4X, and 8X numbers indicate the bandwidth speed in relation to the speed of AGP 1.0 (266 MB/s). For example, AGP 3.0 runs at eight times the speed of AGP 1.0, so its maximum bandwidth is eight times (8X) that of AGP 1.0. Microsoft has named AGP 3.5 Universal Accelerated Graphics Port (UAGP), but its transfer rate, voltage requirement, and other details are identical to AGP 3.0. AGP Pro may be useful for power-intensive tasks, like very advanced graphics programs. You can read more about AGP Pro in the AGP Pro Specification [PDF]. AGP was introduced by Intel in 1997 as a replacement of the slower Peripheral Component Interconnect (PCI) interfaces. AGP provides a direct line of communication to the CPU and RAM, which in turns allows for quicker rendering of graphics. A PCI bus normally runs at a speed of 33 MHz, allowing it to transfer data at 132 MB/s. Using the table from above, you can see that AGP 3.0 is able to run at over 16 times that speed to transfer data much quicker, and even AGP 1.0 exceeds the speed of PCI by a factor of two. 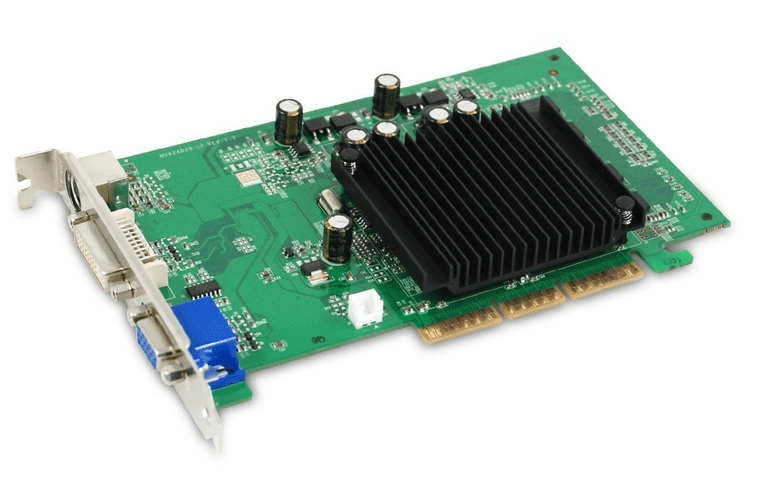 While AGP replaced PCI for graphics, PCIe (PCI Express) has been replacing AGP as the standard video card interface, having nearly completely replaced it by 2010. Motherboards that support AGP will either have a slot available for an AGP video card or will have onboard AGP. AGP 3.0 video cards can be used on a motherboard that supports AGP 2.0 only, but it will be limited to what the motherboard supports, not what the graphics card supports. In other words, the motherboard will not allow the video card to perform better just because it's an AGP 3.0 card; the motherboard itself is not capable of such speeds (in this scenario). Some motherboards that use only AGP 3.0 might not support the older AGP 2.0 cards. So, in a reverse scenario from the above, the video card might not even function unless it's capable of working with a newer interface. Installing a graphics card into an expansion slot should be a pretty simple process. If you're having problems with a video card that has already been installed, consider reseating the card. This goes for AGP, PCI, or PCI Express. Check your motherboard or computer manual before you purchase and install a new AGP card. Installing an AGP video card that is not supported by your motherboard will not work and may damage your PC.